Opening this weekend is another entry in the successful Planet of the Apes reboot: War for Planet of the Apes. The 2017 sequel to 2011’s Rise of the Planet of the Apes is the third installment in this “reboot” film series. The film finds the intelligent apes led by Caesar doing battle with an army of humans. Matt Reeves returns from Dawn of the Planet of the Apes to direct this film. The cast includes Woody Harrelson as the Colonel and Andy Serkis, who returns to provide motion capture for Caesar. 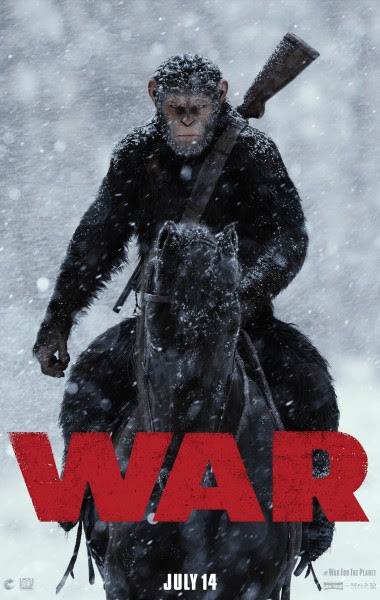 Two years after the events of Dawn of the Planet of the Apes, Caesar and his apes have been at war against the humans. As the apes start suffering heavy losses, Caesar wrestles with his darker instincts in order to face the Colonel and the traitorous gorilla Red. We loved the original film series as a kid, despite how goofy the story lines became and how they began to cheapen-out on the special effects. However, we still refer to Thumbhole stocks on rifles today as “Planet of the Apes” Stocks. There was a TV series that ran for one year (1974) that we enjoyed as a five-year old, and someone produced a cartoon series that we watched a few years later that was well-done for its time. 1970s anachronisms aside, our least favorite treatment had to be Tim Burton’s 2001 version. We like the reboot better than the original in some ways. It has a better thought-out plot and story line for starters. And lots of guns for those of us who enjoy such things. “Take your stinking paws off me you damn dirty ape”. Um shouldn’t there be a list here or something? I hate when a person refers to themselves as “we”….. it throws off my reading mojo when I have to take a second to figure out if they are refering to themselves singularly or using the plural “we”. We strive for a proper use of language. I’d love slide-fire stocks more, if they just didn’t tear the fur off my damn dirty-ape trigger-finger. In An Evening With Kevin Smith, Smith describes how after watching the end of the Burton film and seeing the ape Lincoln memorial, he made mention about how Burton lifted the idea from him. Smith had released a small run Jay and Silent Bob comic which mentions an a Planet-of-the-Apesesc takeover of society and the ape memorial. Burton supposedly had a fit and made a statement that he doesn’t read comin books, which was pretty obvious by his now ridiculous Batman films. Yeah we’re going to see this one…I assume the critters win. I loved the last one even with it’s silly Chimpanzee one handed gunplay. APES rule-humans drool? *This film is brought to you by the same funders of BLM. Thank you. Beat me to it. Thanks. Yeah, I saw the trailers for this latest remake and that was enough for me. Could not get past the one handed, dual weapon, horseback mounted one shot one kill instant ability of the apes. I will stick with the originals thank you. Woody Harrelson? Not a chance in hell. What a great list of guns!!!????????????????? Come on guys, not a single gun mentioned?